We are back with another set of photos for you from the Big Brother 2014 cast, as the Photo Booth was opened again for the remaining HGs and it looks like they might even be over it all on Big Brother 16. Not as many pictures this week and Christine seems to be in all of them and making those lame faces in every one of them! 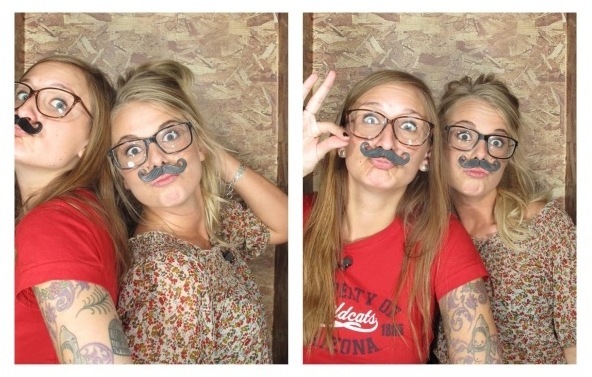 Check out the Week 6 Photo Booth gallery below in our Big Brother 2014 spoilers! We all know that things can get pretty boring in the Big Brother 2014 house, so we have to remember this is something different for the HGs and can bring some excitement in a boring day. However, maybe they were all focused on getting Zach out this week and didn’t want to take pictures??? Really, BB? A mustache? Because these hgs need another reason to give us the pucker pose! For all the dislike of Christine as a player, you have to admit she is TRYing to do some unusual poses to be more interesting. She doesn’t always succeed … but she’s trying! If at first you don’t succeed, try try try again…and then GIVE UP!!! Actually I think the one pic of Christine without her glasses (in her mouth) is a nice pic of her. It actually IS quite a nice picture of her. OMG, Mary, that is funny!! This group just gets stranger by the minute. They are all in one alliance to drive us nuts. This is not even Todds site it is Carrie West? See the Top. Thanks Mary. I don’t know how this was sent to me? HAHAHAHA funny Cat. I hope you enjoy your company. See you are so missed when you are not on here. OMGosh, Cat. I’m running out of ways to compliment your sense of humor…. Thanks for another, truly LOL! Awww…that’s sweet. I can’t go one day without you guys. Heck i can’t go HALF a day!! I start twitching. My fingers have a mind of their own. Wait…that didn’t quite sound right. You should see me over the weekend. Hubby will not let me near a computer with my pinched nerve in my neck. He said 9 hours a day 5 days a week is enough. I am having withdrawl’s by Monday. My office is separate from the house and come Friday afternoon I give him my key, so no way of getting in. I sometimes can not stand it. LMAO now that would be good. I think we mess with him enough. hahaha still laughing women. Yes, where there’s a will there’s a way. Especially when it’s a new show on Sundays. I know your hubby is one wonderful guy but it’s BB, I’m sure he’d understand. My nephew is here for the week, I may have to take him to Walmart shopping. What a hoot you ladies are. You make my day. Never, never, never Cat. We have to stick together on this one. If you could just see him during the BB show. Now I have my 14 year old nephew watching and have him wondering how I know what is going to happen. They just wont know how to take me. I love messing with them. Gm Cat and good one, he would think I am nuts. Wow Cat, you are one bad cat! hahaha!!! Can I have a few words with your nephew, I promise not to tell him anything….choke choke. Same here ok? Mary, Mary who? No, that did not sound right. That’s an understatement Carol. Glad you’re back Cat but Lilly, don’t sell yourself short, we all love you! Yes we do Mary. The folks on here are AWESOME. Feel like I have known you all for years. LOL thought you were on a Cat Nap! Wow, Joyce, thank you. The ONLY thing good about BB15 (for me) was the online buddies it brought together here, and the real-life, thoughtful discussions – sometimes debates – we had here. THAT part of last season I’m grateful for! I feel the same way Lilly. HAHAHA you have never been lost for words, my friend. LOL (again)! You are so right!! Okay, you’re goanna make me cry. Love everyonr here, it IS the best site! Good morning Mary. Yes it is, and than you Todd. Good morning Carol! Happy hump day! Would it not be cool on the DE that America can bring one back by voting. I do hope that if they decide to bring someone back they let america have the vote…and not some lame comp that could be perceived to be geared to a certain player. I agree. I hope Donny don’t go anywhere this week and he wins HOH next week. That would be sweet. I’ve never really been in favor of a returning hg. It’s fun to watch but i just think once evicted they should stay that way. No second chances. And most of them get evicted again right away. I agree. A returning hg is nothing but a quick-fix for our excitement fix. It’s always short-lived and unsatisfying in the end. It’s a cheap way for BB to generate ratings but just screws up someone else’s game who is in the house. If we do get to vote someone back, we should vote for Devin. Can you imagine how much that would mess everyone up…could be VERY interesting! I think it would be hilarious!